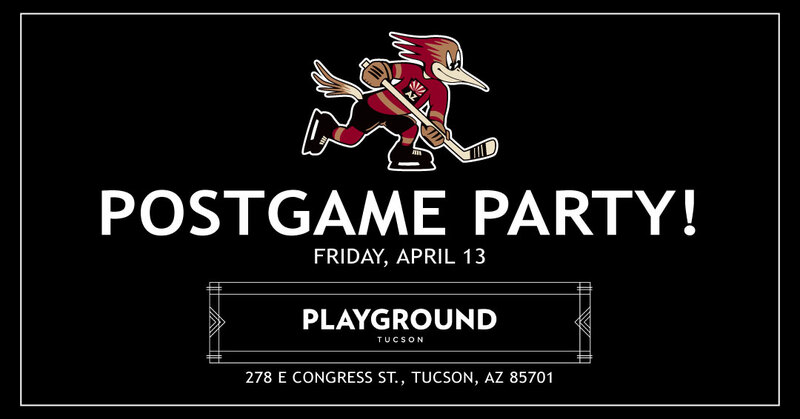 TUCSON, AZ – The Tucson Roadrunners, proud American Hockey League affiliate of the Arizona Coyotes, shared today that the club will be having a post-game party for fans following Friday’s game at Playground. Formed in the center of Tucson’s booming downtown, Playground will welcome all Roadrunners supporters 21 years of age or older through the VIP entrance with ticket stub or proof of attendance at the team’s game on Friday. Drinks specials will also be served throughout the remainder of the evening. Tickets for this Friday’s game, which can also be purchased in a Playoff Push Pack, are on sale now HERE.